Jews who campaign alongside people from other communities for workers’ rights, civil liberties and the rights of refugees, and against discrimination and injustice. 1974-1977 The JSG is founded by individuals in Manchester/Liverpool among individuals with current or past affiliations to the Labour Party and Communist Party, as a lobby group campaigning around two issues: awakening the Left, anti-racists and the Jewish community to the growing threat posed by the National Front; and encouraging Left parties and groups to relate more positively to Jewish issues including their analysis of the Israel/Palestine conflict where opposition to Zionism sometimes slipped into antisemitism and neglected/ignored progressive groups among Israelis. 1977 A London branch of the JSG begins to meet. 1978 The JSG campaigns in support of the Anti-Nazi League in the face of opposition from the Board of Deputies of British Jews. Cambridge JSG forms. There are growing public confrontations with the Jewish establishment over anti-fascist strategies and affiliations. 1979 The JSG’s London branch establishes regular fortnightly meetings. The JSG’s Annual Conference confirms that the JSG has moved beyond being a lobby group on single issues to being a permanent political organisation with policies on a range of issues, including the Left’s approach to cultural/national identity. A “consciousness raising” group focusing on identity issues is formed in London. 1980 The JSG engages in street-level campaigning in local Jewish communities to mobilise responses to attacks on Jews and other ethnic minorities. The group publishes articles and holds meetings confronting antisemitism within the Left. JSG student groups and discussion groups are established at Manchester University and Bristol University. The JSG participates in the 'Beyond the Fragments' conference, an event aimed at rebuilding the Left with full participation of autonomous movements. 1981 At an acrimonious annual conference the JSG adopts a new manifesto, influenced by Bundist perspectives, and a new internal democratic structure. It sharpens its policies on the Israel/Palestine conflict (recognising the PLO as the legitimate political representatives of the Palestinian people) and on confronting the Jewish establishment regarding strategies for combating antisemitism. In the aftermath of the conference, several members (especially in Manchester), including some of the group’s founders, split off from the JSG. A JSG student group is established at Sussex University. 1982 The JSG becomes a founding member of the International Jewish Peace Union, whose moving force is Maxim Ghilan – a Jewish activist in France facilitating behind the scenes Israeli-PLO dialogue. The JSG cooperates with left-wing Israelis and unaffiliated Jews to set up the Campaign for Israel-Palestine peace (CIPP). The JSG takes its banner for the first time on demonstrations called by Palestinian organisations (against the war on Lebanon). The JSG publishes 'Jewish Socialist Perspectives' — a collection of articles by members. The JSG distributes a pamphlet by French neo-Bundist Richard Marienstras, produced by the Medem Jewish Socialist Group in New York. 1983 The group helps CIPP organise first public meeting in Britain with Uri Avnery from the Israeli peace movement and Dr Issam Sartawi from the PLO on the same platform, at County Hall, London, attended by 300 people. The JSG provides stewards for this event and others in a volatile atmosphere around Israel/Palestine meetings. The group vigorously challenges a smear campaign against the JSG led by the Association of Jewish Ex-Servicemen (AJEX). The JSG’s annual conference further clarifies position its position on Zionism and the diaspora, affirming its diasporist political perspectives. 1984 The JSG receives a grant from the Greater London Council (GLC) to launch the Jewish Cultural and Anti-Racist Project (JCARP). JCARP holds a conference on 'The Jewish anti-Racist Tradition', addressed by Cable Street veteran Charlie Goodman and other speakers. JCARP opens a Yiddish class in London and launches other Yiddish cultural activities. 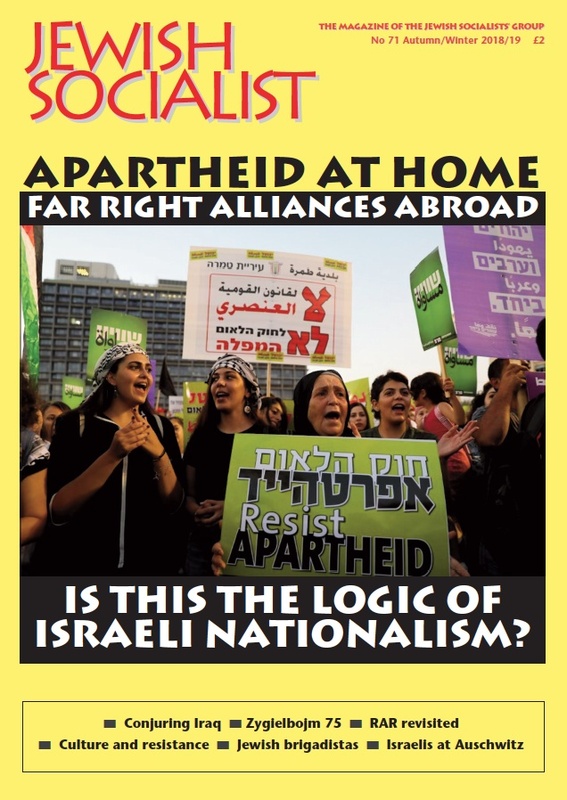 The JSG publishes campaign briefing material on diasporism, Soviet Jewry, Israel/Palestine, fighting racism and fascism. AJEX, supported by the Board of Deputies and the Jewish Chronicle, step up the smear campaign against the JSG. The group publishes an exposé of their lies and misinformation called 'False Witness'. Right wing Zionists attempt to physically break-up JSG/JCARP public meetings. 1985 JCARP launches a touring exhibition 'The Aliens Act Revisited' recalling the 1905 Aliens Act and making links with current campaigns in support of immigrants and refugees. JCARP publishes 'Facing Up to Antisemitism: how Jews in Britain countered the threats of the 1930s'. JCARP holds a conference on 'Countering Racism and Fascism'. The JSG launches 'Jewish Socialist' as a 28 page quarterly magazine and elects an editorial board. The group makes contact with the Union of Progressive Jews of Belgium. The editor of ‘Jewish Quarterly’ magazine is sacked after publishing an article by a JSG member criticising defence policies of the Board of Deputies past and present. 1986 JCARP Publishes 'From Awareness to Action' — the papers from its 1985 conference. A commemorative meeting is held in Manchester to remember and celebrate the life of the late Joe Garman, a founder member of JSG. The group supports the launch of Jews Against Apartheid, which is chaired by JSG member Shalom Charikar. A Jewish Socialist discussion group is formed in Newcastle. The veteran Jewish trade unionist, Mick Mindel speaks at a JSG May Day event in the East End. A JSG contingent marches on the 50th anniversary of Cable Street parade and festival. 1987 The group holds a large meeting in London addressed by Meir Vanunu, brother of imprisoned nuclear whistle-blower Mordechai Vanunu. Together with Khamsin (Middle Eastern socialists) and Jewish Women support the Palestinians, the JSG organises a benefit at the Red Rose Club, London, in support of Yesh Gvul (Israelis refusing army service in Lebanon and Occupied Palestinian Territories) and Palestinians women’s committees in the Occupied Territories. JSG delegates attend and speak at Bund 90th anniversary seminar and celebration in New York. The JSG holds a 90th anniversary Bund meeting in London, with Bundist veteran Majer Bogdanski as the main speaker, and launches a pamphlet ‘A Revolution in Jewish Life: the Jewish Workers’ Bund' written by Clive Gilbert with a foreword by Majer Bogdanski. The JSG updates its manifesto. 1988 The JSG holds two public meetings with Jewish and PLO Palestinian speakers in solidarity with Israelis and Palestinians fighting against Israel’s occupation of Palestinian land. JSG members are active in helping to launch “Friends of Yesh Gvul” . JSG delegates are active in the Joint Committee for Palestine. A discussion at JSG conference on homophobia leads to the formation of Jews Against the Clause (later Section 28). 1989 JSG members in a delegation of the International Jewish Peace Union meet with Yasser Arafat in Paris. The JSG lays a wreath and addresses a rally at an anti-fascist Remembrance Day demonstration at the cenotaph organised by Searchlight and other anti-fascist groups. The group publishes a statement in support of Salman Rushdie, under threat from Islamic fundamentalists. A JSG group is formed in Nottingham. 1990 Furore over JSG members excluded from an Israeli film festival by the Jewish community 'security', CSO (later renamed CST). A bumper 5th anniversary issue of 'Jewish Socialist' is produced and an anniversary benefit for 'Jewish Socialist' magazine is held at Swiss Cottage Community Centre with Jewish and Irish bands and poets. The JSG jointly organises a picket of Enoch Powell at Yakar, north west London, together with Mapam. A local JSG group starts to meet in Hackney. 700 attend a day of 'Jewish Culture and Resistance' organised by Hackney Jewish Socialists’ Group. JSG delegates attend Brussels conference of Jewish socialist organisations from Belgium, Britain, France and Holland. The JSG holds a large public meeting on the rise of antisemitism in Britain and France. 1991 The JSG features in 'A sense of Belonging' a TV documentary about Jews in Britain. The group holds a public meeting to mark the 50th anniversary of the deaths of Bund leaders Erlich and Alter. There is a film benefit for Jewish Socialist magazine at the Rio, Dalston, showing 'Forever Activists' about Spanish Civil War veterans and 'The Golem of Princelet Street.' The group publishes 'Beyond the Slogans', a collection of articles from 'Jewish Socialist' on Zionism. A Jewish/Palestinian Seder Night is held with PLO representative Afif Safieh and family as guests. 1992 JSG members receive threatening phone calls from fascists. JSG members are active in protests against Holocaust revisionist David Irving. A local JSG starts meeting in Norwich. Jewish Socialist magazine opens a controversial debate on circumcision. The group supports demonstrations against the Gulf War. 1993 Together with Bundist survivors, the JSG helps to form the Szmul Zygielbojm Memorial Committee, to campaign for a permanent memorial in London to a Bundist anti-fascist who committed suicide in London in 1943 as a political protest. The JSG is active in the ‘Unity’ committee organising a march on the BNP’s headquarters. The magazine publishes ‘You Are, Aren’t You?' a collection of poems by Mike Rosen, jointly with Mushroom Books. Israeli and PLO speakers share a platform at public meeting organised by Nottingham JSG. The group leaflets the Chief Rabbi’s 'Jewish Unity' walk in Hyde Park in support of Jewish gays and lesbians excluded from the walk. 1994 There is a large JSG contingent on the TUC march against racism in London’s East end. The Cochrane Theatre hosts a sell-out Comedy Night benefit for 'Jewish Socialist' magazine with Jo Brand, Jeremy Hardy, Linda Smith, Arnold Brown and Ivor Dembina. The group holds a dayschool on Women, Equality and Community. JSG members are active in a newly formed Jewish Women’s Network. 1996 The unveiling of a memorial plaque for Szmul Zygielbojm is attended by 200 people. There are speeches at the commemorative meeting from the Polish Ambassador, Bundist veterans, JSG members, Professor David Cesarani, and Zygielbojm’s family in America. The JSG is part of the organising committee for the 60th anniversary of Cable Street, and there is a JSG speaker at the rally. A Music and Comedy benefit for 'Jewish Socialist' magazine is held in Nottingham. 1997 A JSG delegate attends the Bund’s 100th anniversary celebration in New York. The JSG forms a Bund Centenary committee which organises 'A day to relate, debate and celebrate 100 years of Jewish Socialism'. 350 attend this event in North London. Lottery funding received for Red Herring Club children’s workshops which are launched at the Bund event. A JSG delegate attends the Bund anniversary conference in Warsaw. 1998 The group holds a memorial meeting for JSG anti-racist activist Reuben Goldberg who died in October 1997. The group holds a public meeting in support of Roma asylum seekers. 1999 The group is active in an emergency Jewish campaign responding to the crisis in Kosova. The JSG publicises its statement on Kosova within the Left and the Jewish community. The group holds a dayschool on 'Rights and Rituals'. A Jewish Socialist Club is launched. The JSG is active in mobilisations in support of refugees and asylum-seekers. The magazine launches a £4000 appeal for a redesign and re-launch of Jewish Socialist. 2000 The group supports mobilisations in support of refugees and asylum-seekers. The redesigned 'Jewish Socialist' magazine is launched. A JSG website is created and goes live.